Our President has taken full credit for the bubblicious markets, of course, and will be Hooverized as they gurgle around the drain. Given his chimerical personality, he may try to put on an FDR mask — perhaps even sit in a wheelchair — and try a few grand-scale policy tricks to escape the vortex. But the net effect will surely be to make matters worse — for instance, if he can hector the Federal Reserve to buy every bond that isn’t nailed to some deadly derivative booby-trap. But then he’ll only succeed in crashing the dollar. Remember, there are two main ways you can go broke: You can run out of money; or you can have plenty of worthless money. On the social and political scene, I sense that some things have run their course. Is a critical mass of supposedly educated people not fatigued and nauseated by the regime of “social justice” good-think, and the massive mendacity it stands for, starting with the idea that “diversity and inclusion” require the shut-down of free speech. The obvious hypocrisies and violations of reason emanating from the campuses — a lot, but not all of it, in response to the Golden Golem of Greatness — have made enough smart people stupid to endanger the country’s political future. A lot of these formerly-non-stupid people work in the news media. It’s not too late for some institutions like The New York Times and CNN to change out their editors and producers, and go back to reporting the reality-du-jour instead of functioning as agit-prop mills for every unsound idea ginned through the Yale humanities departments. Shoehorned into the festivity of the season is the lame-duck session in congress, and one of the main events it portends is the end of Robert Mueller’s Russia investigation. The Sphinx-like Mueller has maintained supernatural silence about his tendings and intentions. But if he’d uncovered anything substantial in the way of “collusion” between Mr. Trump and Russia, the public would know by now, since it would represent a signal threat to national security. So it’s hard not to conclude that he has nothing except a few Mickey Mouse “process” convictions for lying to the FBI. On the other hand, it’s quite impossible to imagine him ignoring the well-documented evidence trail of Hillary Clinton colluding with Russians to influence the 2016 contest against Mr. Trump — and to defame him after he won. There’s also the Hieronymus Bosch panorama of criminal mischief around the racketeering scheme known as the Clinton Foundation to consider. Do these venal characters get a pass on all that? Rep. Mark Meadows (R-NC) has announced plans to call Federal Attorney John Huber (Utah District) to testify about his assignment to look into these Clinton matters. It’s a little hard to see how that might produce any enlightenment, since prosecutors are bound by law to not blab about currently open cases. The committee has also subpoenaed former Attorney General Loretta Lynch, former FBI Director James Comey, and others who have some serious ‘splainin’ to do. But if both Huber and Mueller come up empty-handed on the Clintons it will be one of the epic marvels of official bad faith in US history. 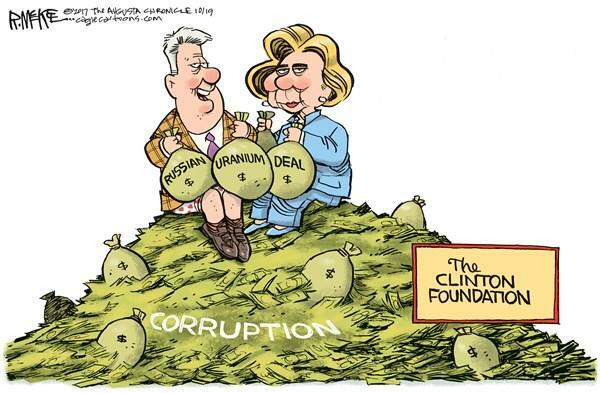 There is a core truth to the 2016 Russia collusion story, and the Clintons are at the heart of it. Failure to even look will have very dark consequences for the public interest.